Freehold Borough Hall is located at 51 West Main Street, Freehold NJ 07728; phone: 732-462-1410. Photo: Hankinson-Moreau-Covenhoven House, ca. 1752, 150 West Main St., Freehold, NJ. Listed on the National Register of Historic Places in 1974. Photographed by User:Josconklin (own work), 2012, via Wikimedia Commons, accessed August, 2013. 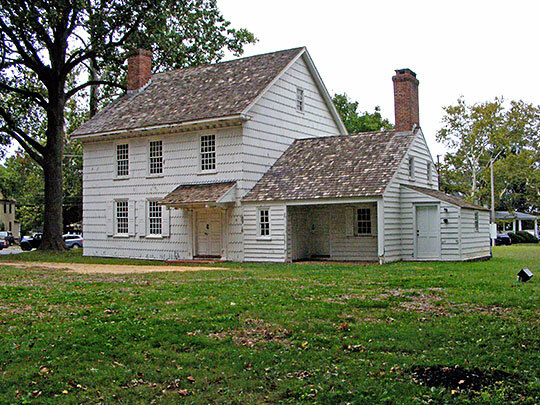 The first white settlement in the Freehold district was made about 1650. A permanent village was established here in 1715 by Scots from New Aberdeen (now Matawan), who had earlier left England because of persecution by Charles II. They chose the name of Monmouth Court House from Monmouthshire in England. Coastal residents complained that politics was responsible for selection of a courthouse site in the inland wilderness, and the record shows that, at the very least, shrewd business sense was involved. In 1714, one year after passage of an assembly act designating Freehold Township as the site, John Reid bought an extensive tract of land. He sold part of his holdings to the county authorities for a courthouse site at the bargain price of 30 shillings, and immensely increased the value of the rest of his property. Colonists gathered in the courthouse to protest the Boston Port Bill; later, in a more militant mood, they heard news of the battles of Lexington and Bunker Hill. In 1778 Freehold saw part of the Battle of Monmouth. On June 27, the day before the fighting, Sir Henry Clinton and his army, retreating from Philadelphia to New York, occupied the town. The British commander and his staff established themselves in the present Moreau House. The first of two early attacks occurred near the present high school on the northeastern edge of the town. On the slight rise of ground now known as Monument Park, behind the present courthouse, Col. Butler's detachment of Revolutionaries fired a heavy volley in the second skirmish, dispersing a body of the Queen's Rangers, the celebrated Tory corps. During the hot Sunday on which Washington's troops tried to shatter the British forces, soldiers of both sides thronged in and out of the village. Lafayette led a party of horsemen down Main Street past the courthouse; various buildings were converted into military hospitals; and local residents fired on the escaping British from the shelter of trees and fences. The New Jersey Gazette later published a withering letter describing British outrages, and accusing General Clinton of conduct by no means to his credit. By 1795 a post office was opened, under the shorter name of Monmouth. Six years later the name was changed to Freehold by postal authorities to avoid confusion with other Monmouths in the county. The first newspaper, the Spirit of Washington, appeared during the years 1814-15; and in 1834 the Monmouth Democrat, still in existence, was established. Several private schools were functioning at the middle of the century, one of which, the Freehold Institute, remains as the Freehold Military School, a preparatory institution. A stage line with railroad connections at Hightstown enabled Freehold residents in 1836 to reach New York or Philadelphia in 7 hours. Plank roads were built to Howell and Keyport, speeding the transportation of marl and farm produce for shipment by water. The Freehold and Jamesburg Agricultural Railroad began service in 1853, and the marl pits at Farmingdale were later tapped by the Squankum Railroad. Both are now part of the Pennsylvania Railroad. A line paralleling the old plank road to Keyport was finally opened as the Freehold and New York Railway in 1880, and was later taken over by the Jersey Central. A disastrous fire destroyed the courthouse and a number of buildings in 1873. The heat was so intense that no trace of the courthouse bell, placed in 1809, was ever found. During the past half-century [1890-1940] Freehold has progressed steadily as a center of agricultural enterprise, known chiefly for heavy shipments of potatoes. Modern concrete highways, some of them following the route of old toll roads, radiate from the town like the spokes of a wheel.